Impress your guests with Asparagus, Tomato and Goat Cheese Salad, a bistro-style dish for four. 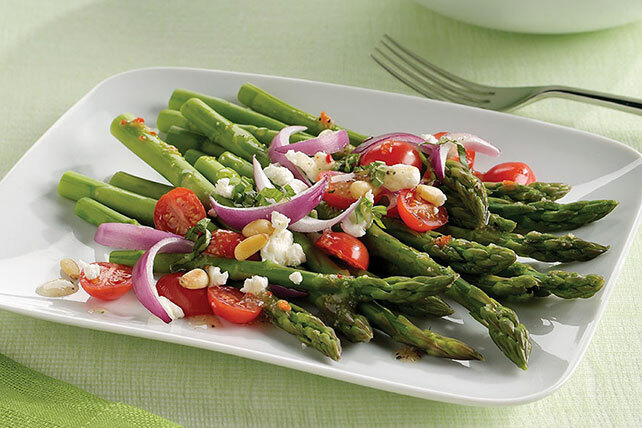 Your friends are sure to love the delicate flavors and rich colors of our Asparagus, Tomato and Goat Cheese Salad. You should probably get working on finding a reason to have them over! Arrange first 3 ingredients on platter. Add asparagus to large pot of boiling water; cook 2 to 3 min. or just until crisp-tender and bright green. Drain; immediately add to bowl of ice water to cool. When completely cooled, drain asparagus, then pat dry.